Last week I altered a couple jeans like this for a friend. Her mom saw them and decided she wanted some too. I used one of the first pairs I did as the length sample since her mom wanted the same. 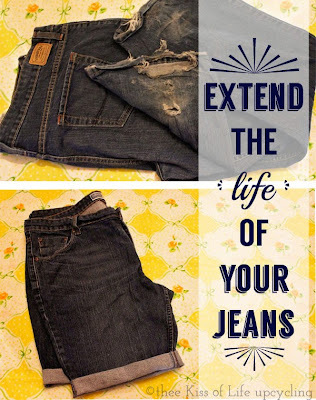 You can take a pair of your own that you like the length of or measure your leg directly. Always line them up together by the crotch and inseam since rises vary. I know it's not that noticeable in the photo but to the sample shorts she also asked to have the holes patched up with black stretch lace underneath. Take your desired inseam length and add on a couple inches for the cuff. I added 2.25" for this cuff. You can do more or less depending on how long and thick a cuff you want. Although I must say thicker is tougher and uncomfortable even if it is stretch denim it'll be tighter. I would've done less actually but I wanted to make sure the fold inside wouldn't show ever. Cut it once you've decided on the length. Serge the ends to seal off the new length. This is sort of optional, I mean you don't have to but I do because it just makes for a cleaner finish. Pin your cuffs in place. I folded it to where a 1.25" cuff would show. Now you'll straight stitch with your machine, only the inseams and outer side seams, not the middles of the cuff. I like to go over a couple times but that's because I used regular thread and not the thick thread for denim. Now you'll hand sew a short blind stitch to secure the middle of the cuff. Again this is optional because once the shorts are on you the cuff should stay in place by being stretched out but in case that doesn't happen, stitching it keeps it from unfolding. You really shouldn't see where you stitched the middle of the cuff. It should just look as if though it were nicely folded shut. There you have it. Turn old pants into new shorts. Also I think this works best with stretch denim. Regular denim tends to make a tighter cuff but you'll be the judge of that.